A fascinating step back in time, in the 16th century Old Goa was referred to as the ‘Rome of the East’, considered the most affluent city in the whole of Asia. Even today its grandeur hasn’t waned, with a number of breath-taking landmarks and attractive architectural themes ready and waiting to fascinate culture vultures and history buffs. The majority of the buildings and landmarks have been well preserved, leading to Old Goa’s status as a UNESCO World Heritage Site. The best way to discover the area during your Goa holiday is on foot, or perhaps with our Glimpses of Goa tour? There are many attractions and highlights to tick off your itinerary when wandering around Old Goa, but first and foremost, just ensure you soak up the history and façade of the area as you slowly meander along old streets and between striking buildings. If there is one site that cannot be missed, it is that of the Basilica of Bom Jesus, one of the most stunning churches in India. Famous throughout the Roman Catholic world, the church contains the tomb and remains of St Francis Xavier. Each year, crowds flock to the basilica to celebrate the Feast of St Francis Xavier, held annually on the 3rd December. Another site, often forgotten but well worth the short drive to, is the Church of Our Lady of the Mount, where its elevated position affords panoramic views over Old Goa and onto the Mandovi River. Se Cathedral is also a prominent member of Old Goa's collection of heritage landmarks, recognised as the largest church of its kind in Asia and home to the famous 'Golden Bell' which is considered as the source of one of the richest church bell tones in the world. 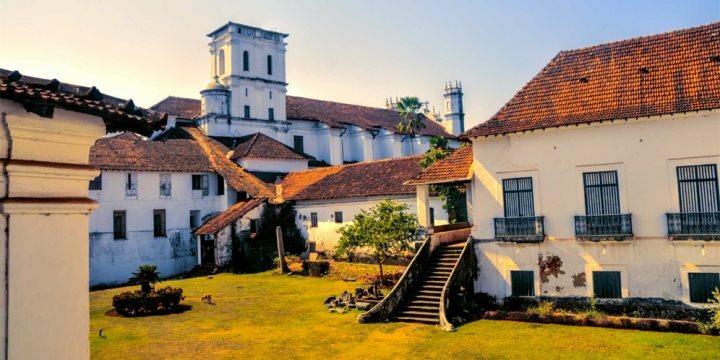 Meanwhile, for a greater impression of Old Goa's history, pay a visit to the fantastic Archaeological Museum where you can examine artefacts and learn about the stories of the area's golden age. Take a look at our 5 things to see in Old Goa blog post.